In Western Canada, companies are required to report benzene emissions from glycol dehydration / regeneration units. 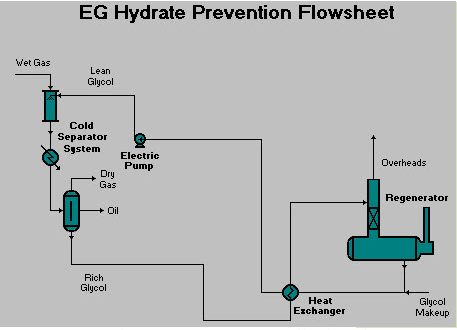 In refrigeration plants, ethylene glycol (EG) is typically injected to suppress hydrate formation. The ?rich? EG which has absorbed water from the gas is then regenerated and recirculated back to the process. However, EG also absorbs hydrocarbons such as benzene which are then typically released to the atmosphere in the EG still. Simulators such as GRI GLYCalc and Aspentech HYSYS are commonly used to predict BTEX (benzene, toluene, ethylbenzene, xylene) emissions from these plants. However, the results from these simulators can also be very inaccurate. One key reason why simulators have difficulty with accurately predicting BTEX emissions from refrigeration plants is that the conditions at the low temperature separator can be troublesome for flash calculations. A 3-phase flash calculation (vapour, hydrocarbon liquid, aqueous or EG/water) at low temperatures (in the range of -10 to -30 C) is required, and often the simulators are simply not ?tuned? to properly predict the partition of benzene to the vapour, hydrocarbon liquid and aqueous phases at these conditions, or even to properly predict the existence of each phase. GRI GLYCalc is known to have difficulties with EG units. According to the GLYCalc documentation, ?In some cases, GLYCalc may fail to predict a hydrocarbon liquid phase when one is actually present. The results produced by the program in this situation should be used with caution.? This can lead to significant overprediction of benzene emissions; in some cases we have seen emissions estimates 15-30 times too high. When constructing the ?DEOS? graph as required by regulators in Western Canada (this graph plots benzene emissions and dry gas water content as a function of glycol circulation rate), a sudden jump or drop in emissions can be an indicator that GLYCalc is failing to properly do the flash calculation at the cold separator. Aspentech HYSYS has historically been ?tuned? for natural gas processes to accurately perform the vapour-hydrocarbon liquid flash calculation at a wide range of conditions, and the conventional property package in gas processing has been Peng Robinson. However, Peng Robinson is not suitable for predicting BTEX emissions in refrigeration plant glycol units. More recently, the ?Glycol? property package was made available, which does a very good job of predicting BTEX emissions in TEG dehydration units, but has not had as much attention for BTEX emissions in EG units. It is an improvement over Peng Robinson, however, for predicting BTEX emissions in EG units. accurate partition of BTEX components to the vapour, hydrocarbon liquid and aqueous phases. This is an approach that Process Ecology has taken in order to accurately predict BTEX, VOC and GHG emissions from EG regeneration units. If you would like to learn more about the results and the details of the thermodynamic models used please contact us.